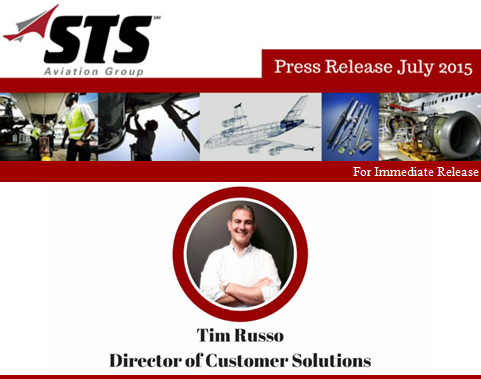 Tim Russo joins STS Component Solutions as its Director of Customer Solutions; responsible for overseeing customer support as well as the development of airline and MRO programs. Palm City, Florida, July 13th, 2015 – STS Component Solutions, a division of STS Aviation Group, is proud to announce the addition of Tim Russo to its leadership team. Tim joins STS Component Solutions as its Director of Customer Solutions, and he will be responsible for the development and enhancement of current / new airline and MRO programs. Tim will also be tasked with guiding both the leadership and direction of STS’ Programs and Customer Support Team. Tim attended New York Technical College where he majored in Electro-Mechanical Engineering and has been certified in Lean Manufacturing (GE) and Six Sigma Black Belt (Villanova University). He served as the Chairman for the North American Airline Loans and Borrows’ forum from 2006 to 2011. Throughout his career, he has also been active in serving the community by participating in numerous volunteer and fundraising activities. Tim currently sits on the Board of Advisers for the American Cancer Society and was most recently featured in Fortune Magazine’s 2015 Heroes of the Fortune 500 List for his work mentoring children with Autism. Tim’s knowledge, experience and in-depth community involvement will surely have a positive impact within both the STS organization as a whole as well as the Customer Support Team at STS Component Solutions. STS Aviation Group is a diversified company that specializes in support services for the aerospace industry through its four divisions, STS AeroStaff Services, STS Engineering Solutions, STS Line Maintenance and STS Component Solutions. From staffing your team so it can get the project done right and at an affordable price, to providing certified aircraft and engine parts so you can get off the ground and back in the sky, STS continues to be a one-stop servicing center for all of your company’s aviation staffing, engineering, line maintenance and component related needs. To learn more about what makes us the company with “Solutions to Keep You Flying,” visit http://www.stsaviationgroup.com or give us a call at 1-800-800-2400.